Ah, springtime… Geese flying, calling across the morning sky; brighter sunshine; longer days; balmy winds; mud underfoot; little rivers running down, down, down, carrying winter away with them. Two days ago, I was walking across the pasture bareheaded, my two small boys tagging along and my baby on my back, watching the creek run. That night another blizzard blew in: now I am listening to the wind howl and the snow beat against the windows and the furnace run, and hoping my husband is succeeding in his attempts to get each calving cow into the barn before she drops her new calf into the snow. March is definitely not coming in like a lamb this year. No matter how it has come, or how it goes, March is certainly going, and quickly. In a few more days, the calendar will tell me that spring has come, even if the weather fitfully disputes the case for another month or two. The sun is higher, nearer, and the winter cannot hold out against it for too much longer. Soon, I’ll find a day warm enough to dry clothes on the line again. I’m looking forward to pulling off my socks and hauling a heavy basket of wet clothes out inthe warm sunshine, wrestling the sheets against the wind, shoving the pins down hard, and hoping things stay put ’till they dry. Few of my household tasks are as pleasant as hanging the washing out for the first time each spring. Yes, I am a country girl; first a farmer’s daughter, now a rancher’s wife. I love hanging out the washing. I’ve done it in all weathers. One of my earliest memories is that of hanging my Raggedy Ann’s aprons and dresses on the clothesline while my mother hung out the washing. I have no idea how it was constructed, but I remember a line just my height strung below Mom’s clothesline. 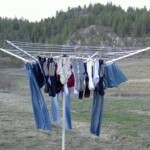 What do you do with a pile of wet clothes if you have no clothesline? Find a fence line! As a new bride, I learned first how to run an old wringer washer, then how to improvise on a clothesline. It was nine months before Ben put up our first clothesline; one he’d bought for a few dollars at an auction sale. (“They’re pretty cheap folks if they even pull up and sell the clothesline when they move away,” was his comment, but he bought it for me.) In the meanwhile, he had strung some lines inside, which I used when the weather was bad. When the weather was good, I hated to hang things indoors, where they didn’t dry very quickly, so I went hunting. I learned that heavy duty cattle panel fencing works marvelously well for a clothes rack, being sturdy and of narrow enough gauge that the clothespins fit. Woven wire worked too, although it sagged worse, but woe to me if my clothes blew over against a strand of barbed wire! 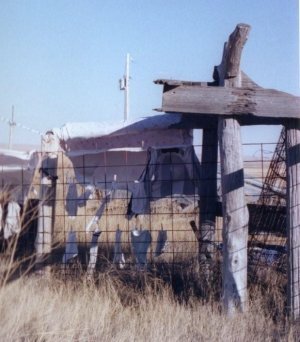 This method is also contraindicated by the presence of calves, sheep, goats, or other livestock on the other side of the fence. It’s probably far more practical to just build a clothesline. If possible, locate a spot in your yard that is sheltered from the wind and not too far from your washing machine. Find two tall sturdy posts and set them about twenty feet apart. Six inch diameter posts nine to ten feet long–you’ll want at least three feet below the ground and six feet above the–are ideal. Next you will need two cross pieces to bolt to the wood posts. Look for two pieces of heavy angle iron or 3/8 inch steel approximately five feet long. These cross arms will need holes drilled in them (at least a foot apart) corresponding to the number of wires you want to string. Bolt these at the tops of your posts, parallel to each other, about five and a half feet off the ground, or at whatever height is comfortable for you to reach and sufficiently high to keep your clothes from dragging in the dirt. Next take a roll of galvanized nine gauge wire and string it between the posts. Pull each wire tight, and you have a clothesline! You can probably buy some sort of ready made contraption to take the place of the cross arms and the number nine wire, but I’ll wager it won’t be as sturdy. Now that you’ve built your line, you need a way to keep wet clothes on it until they dry–preferably until you take them off again. I’ve known clothespins in two forms; those made of a single piece of wood, in the shape of a little man without arms, and those made of two pieces of wood and a metal spring that holds the jaws shut. Make sure that you buy clothespins made of hardwood, and if you buy the spring-type, make sure the spring is strong. Before hanging any clothes on the line, make sure all the wires are taught. A saggy wire will sag much worse with a heavy load of wet clothes weighing it down, and clothes on a saggy wire will tend to slump together and not dry well. When stringing your wires, keep your helpers in mind. One of my delights of motherhood are the little hands of my children handing me clothespins and socks. Even before they could walk, they could sit on the ground beside the basket, or on a rug, if the ground were cold or damp, and hold the bag of pins, reaching in to pull them out for me one or two at a time. Do you know how many useful lessons are in this simple task? As soon as they could walk, they were trying to help hang the socks and other small articles on the line. I didn’t have a low line strung just for them; instead, my clothesline was set on a sidehill, so that the northernmost line was only about three feet off the ground where it sagged in the middle, while the southernmost line was above my head. That sag in the line broke a cardinal rule of good clothes hanging, but it enables my little ones to help–something I value far more than a perfect clothesline! What about the washing? Before dirty clothes are ready to hang on the line, they have to be washed first. In my world, clothes come in dirty. Two little boys can get dirty without trying, especially while reveling in the glorious mud of spring. My husband’s clothes meet the worst in his line of work in all seasons: cow manure, calf scours, diesel fuel, blue grease, gasoline, hydraulic oil, and, last but not least, dirt. My neighbor has told me that her mother-in-law once asked how she got her husband’s clothes clean, and his reply to her was, “She uses good soap.” It works. The only thing I can add to that is: use good soap and plenty of it. Put liquid soap directly on the worst spots and let it soak in for 12-24 hours before washing. Add a product such as Borax or Oxi-Clean to cloth diapers to help eliminate odors. Add Oxi-Clean to any heavily soiled load. Soak food or blood stains in white vinegar; add ammonia to the”work clothes” load to help take out the grease and grime. Run the diapers for an extra rinse to be sure to get all the soap out; do the same for any load you pre-treated with extra soap. Okay, so how soon will it be warm enough to hang the clothes on the line? I can’t say how soon–we’ve another blizzard in the forecast–but I can give you Mom’s rule of thumb for determining when to hang that first load outside. She made us wait until the thermometer said fifty degrees (Fahrenheit). Her reasoning? That’s approximately the temperature at which clothes will dry in one day, if you get them out early enough in the morning. If you don’t mind leaving them out overnight, you can hang them out in cooler weather. I have even hung clothes out in below freezing weather, but you’ve got to be either desperate or tough or crazy, or all three. My wringer didn’t take as much water out of the clothes as an automatic washer with a spin cycle, so allowing them to freeze-dry before hanging them indoors significantly reduced the puddles on the floor. Mom’s only exception to her rule was for diapers. She wanted them sunbleached, regardless of whether they had any chance of drying or not. Once or twice each week, no matter the temperature, no matter if the diapers froze stiff before I pinned them to the line, the diapers went out. When I went out again to pull the clothespins off and unbend the stiff pieces of cloth from the wire, all but the worst stains were gone. After clunking round and round in the dryer for awhile, eventually softening and drying, we had a stack of snowy white diapers to return to the shelf. If, “Dewbleaching works wonders,” according to Mrs. Rachel Lynde, sunbleaching works better than Clorox. One other factor to keep in mind: the wind. Maybe the wind doesn’t blow much where you live, but here in South Dakota I can pretty well count on the wind blowing when I hang clothes out. The wind will either take the wrinkles out, or put them in, depending on how you hang the clothes and how hard it’s blowing. The wind will either be your best aide, or else create chaos on your clothesline! Sometimes I question my sanity in trying to hold out against a twenty-five mile an hour wind with mere clothespins. 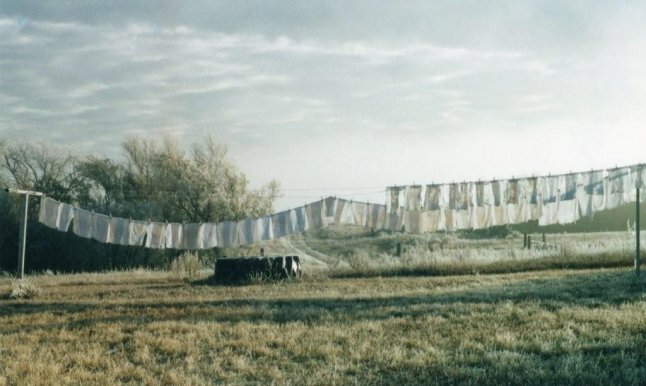 There are days when I wonder if my clothes will end up in the next county, or at least in the neighbor’s fence, before they dry. I shove the pins down hard, well past the open place in the jaw, and if the wind is blowing really hard, I fold things like sheets smaller, so they have less surface area for the wind to catch. As a general rule, the way you hang your clothes is the way they will dry. Fold sheets in half, then pin the open edges to the line, with the fold hanging down. Hang shirts by the hem, unless it’s very windy. In that case, or if you don’t have enough room on your clothesline, hang them by the collars. Hang jeans and skirts by the waist. Hang socks by the toe end–they dry fastest this way. Dishtowels can be folded in half vertically to save line space, if necessary. One other rule I always follow: hang delicate items somewhere on the line where they will not be immediately obvious to the passing world. Hanging things in this way will allow the wind to shake the wrinkles right out of the clothes, leaving them soft and smooth. The sheets will already be folded in half, the shirts won’t need ironing, and if you fold things as you take them down, they won’t get wrinkled in the basket! Of course, there are the days when the wind is blowing hard, and the shirts get all wrapped around the line, and the jeans get jerked off into the grass, and the socks bunch together, and the best laid plans o’ mice and men and housewives “gang all a’gley.” But so be it. I unwind the tangles, shake the grass off the things that fell down, drape the things that are still damp over the back of a kitchen chair, and enjoy the fresh smell of the clothes anyway. The smell? Well, it’ll make your labors all worthwhile. Your clothes will smell of spring air, of summer sunshine, of fall frosts. These beat any scented dryer sheets or fabric freshener all hollow. There’s nothing quite like crawling into a bed newly made up with clean sheets that smell like a prairie wind. Ladies, do you have an opinion on hanging out washing to dry on a Sunday? 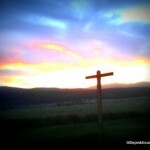 Sarah, I’m a Sabbath Keeper but here’s how it is for me. I wouldn’t feel comfortable hanging out washing to dry on Sabbath unless it was an absolute emergency. (Children sick and every towel and blanket in the house is dirty but needed type of thing) For me, I think keeping “every day” work that isn’t necessary to the rest of the week helps me to focus more on worshiping God and refocusing. Plus, it is one day a week and often a much needed rest from a long week! I so enjoy reading your posts on here, as I get a taste of what your life is like. 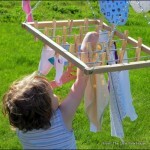 Thank you for sharing with us your love for hanging wash outside. My dad and brothers built us a sturdy, 5 wire clothesline last Summer, so we have been enjoying our spacious area tremendously. 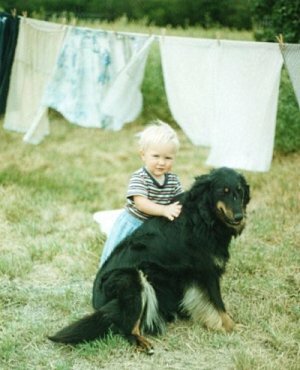 We’ve had two situations with air-dried clothes that made us wonder if it was such a neat thing to do, (the time when our two puppies made a game out of pulling everything off the line and ripping clothes to shreds, and the time when Andrew found a bat in his pair of jeans!) but the fresh air smell makes up for the hassles! I pray that you have a blessed day. Yet I could so relate to the struggle to get a man’s clothes clean. Sometimes it seems that no matter how hard you try… it just wont come out of its own accord clean. I love hanging the clothes on the line. My mom taught me to hang things out shortest to longest or longest to shortest so that the clothesline looks neat and tidy. We start hanging the clothes out as early as we can and keep on hanging until it’s “freeze your fingers” weather. Mmm! I LOVE climbing into a bed of clean line dried sheets after a bath! It reminds me of my Grandma’s house, and of summer. Sweet article. There is nothing better than line dried clothes. Perhaps that’s why I’m childishly giddy about the likelyhood of having one again this summer. If only I had it already… it’s warm enough to dry two loads today. Yay! I sent a comment a little while back asking for a ‘how to hang laundry’ post, because I don’t have a tumble-drier (and don’t want one). Eagerly looking forward to the second installment! Yes, Dorothy, this one’s for you. I hope you find it helpful! 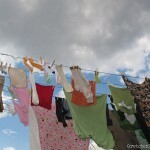 I’ m not sure if it’s entirely possible to avoid chaos on the clothesline-where I live, the wind causes most of it! Lora—Check out farmcollie.com, and englishshepherd.org, or do a search for English Shepherd. Our “Jill” was not an ES to our knowledge, but she fit the description. I love your post! It’s so enjoyable to read things like this. That photo is beautiful. Thanks for sharing and I’ll keep watch for the next part! I’m blessed enough to live where I can hang out the laundry for 9 months out of the year. I love it too! The picture of the dog and boy caught my attention though. My rescue “mutt” looked just like him(or her). I’d love to know more about the dog in the picture or if anyone knows where to find a dog like that. 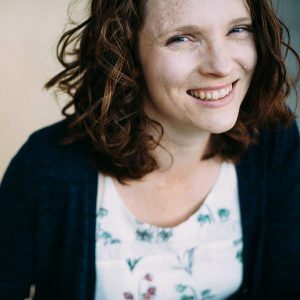 I LOVE hanging out the laundry… slipping into sheets that smell of fresh air, folding the crisp, windblown clothes that smell like no fragrance could ever capture…ahhh… in a little while, we’ll be able to do so in Maine too!